It's reported that the Wilkins Ice Shelf is on the brink of collapse and a paper in Nature  offers clear evidence that Antactica is warming in step with the rest of the world (BBC, NYT) . Wally Broecker's climate "monster" may be stirring . Barry Lopez wrote Arctic Dreams before present rapid changes in the Polar climates were well understood. But Lopez was haunted by unease at the role of industrial man, alluding to the Eskimo terms ilira, fear that accompanies awe, and kappia, fear in the face of unpredictable violence. 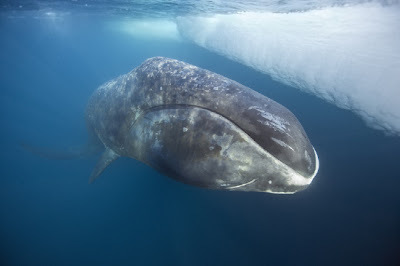 As late as the early industrial period (the early nineteenth century), creatures such as the Greenland right or Bowhead whale (Balaena mysticetus) still resonated with something of the monstrous that had fascinated and appalled earlier Europeans. Today our "monsters" lurk elsewhere. Ilira kappia stabs us not from behind but from within our own shadows. 1. 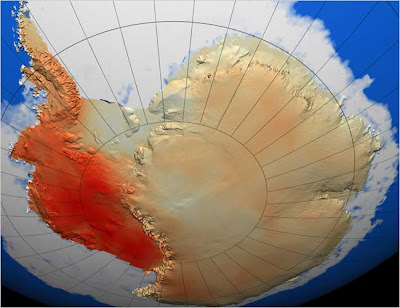 Warming of the Antarctic ice-sheet surface since the 1957 by Eric Steig et al (doi:10.1038/nature07669). In State of Antarctica: red or blue? at Realclimate, two of the authors try to pre-empt misinterpretation. 3. See also Attribution of polar warming to human influence by Nathan P. Gillett et al (doi:10.1038/ngeo338). 4. The discovery in 1985 of the "ozone hole" above Antarctica shocked many people into increased awareness of the potential of human activity to substantially affect whole earth systems on a short time scale. It helped pave the way for greater acceptance of the case for anthropogenic global warming. (See Breaking into politics 1980-88 in The Discovery of Global Warming by Spencer Weart). Arctic Dreams was published in 1986. I have recently gone back to if for the first time in many years thanks, in part, to a prompt by JML. To speak of large-scale changes in the natural world that might be traced to human activity is anathema to people still furious at Darwin for suggesting that 'nature' included man...[In] America, mainstream politics is uninformed by, event hostile to, biology. 6. Lopez quotes the Canadian historian W. Gillies Ross as 'cautiously' suggesting that as many as 38,000 Greenland right whales may have been killed in the Davis Strait fishery, largely by the British fleet. 'A sound estimate of the size of the population today  is 200.' 90% of the indigenous human population may also have died as a result of European incursion and infectious diseases.